Ulefone Power 5 has been launched quietly by the company, the device popped up on popular online store Aliexpress and retails like a midrange smartphone. It’s name reminds us of the Leagoo Power 5 but with a bigger battery capacity this time around. The device was first announced at the 2018 Mobile World Congress and now this powerhouse has graced us with its presence. The Power 5 boasts of 6GB of RAM, 64GB storage, supports wireless charging and runs on Android 8.1 Oreo. Want to know more? Stay with me. 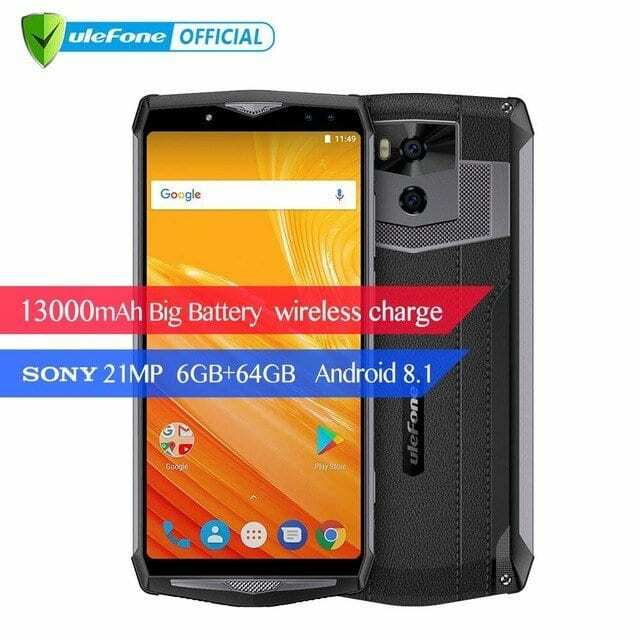 What is Ulefone Power 5 Price and Availability Status? Looks like a rugged smartphone, thanks to the combination of Metal and Leather here. The Metal exudes where the rear features are, while the overall body is covered by Leather, giving a natural and unique feel when held. Sporting dual rear shooters, which are vertical at the top middle. There’s a dual-LED flash beside the first camera, while the fingerprint scanner was moved to the side. 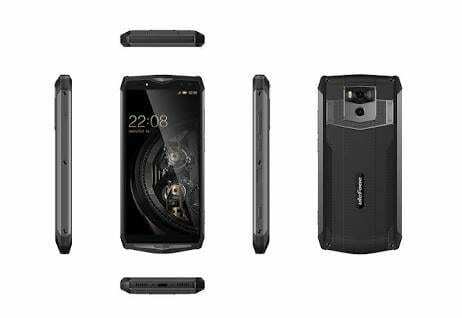 The Hexagon-like shaped smartphone is NOT water resistant even though it looks like a budget smartphone. Nonetheless, it’s splash proof, measuring 15.8mm in thickness and weighs an astonishing 290g overall. It’s available in Black and Gold colors only. Even with its rugged-like body, it dishes out a Full View display, just like what we saw on the HomTom HT70 smartphone. The metal finishing at the top and bottom bezel makes this device look as premium as ever from the front. The top bezel might be somewhat minimal, but it still managed to house the usual features. Dishing out immersive visuals is the 6-inch FHD+ IPS LCD capacitive touchscreen, which boasts of 1080 x 2160 pixels in resolution. Watch your movies and games in sharp motion with 402 pixel per inch density. The screen has Color LED Notifications feature and stretches up to 70% screen to body ratio. Under the hood is the MediaTek Helio P23 MT6763V chip with an Octa-core processor and 64-bit CPU architecture. The 8-cores of processor here clocks at a speed of 1.5GHz with 28nm process technology. Handling graphics is the ARM Mali-G71 MP2 graphics processor with 2-Cores that clocks at 700MHz. There’s a bigger 6GB RAM here for multitasking through all your heavy apps and games. It has a memory speed of 1.6GHz with 64GB internal storage space available and upgradeable up to 256GB. The Ulefone Power 5 runs on Android 8.1 Oreo operating system out of the box. The dual 21MP + 5MP Sony IMX230 Exmor RS shooters with CMOS sensor has 1.029 µm pixel size and f/2.0 aperture. The camera has lots of features including a dual-LED flash and is capable of taking clear photographs and videos of 1080p at 30fps. Enjoy twice the fun in terms of selfies, the 8MP + 5MP selfie shooter will do the trick. Powering the Ulefone Power 5 is 13000mAh non-removable Li-Po battery with fast charging and wireless charging technology. With the fast charging feature, it shouldn’t take up to 2.2 hours to fully charge up the battery from 0% to 100%. The Ulefone Power 5 is available on Shopping stores from $299 (N100,000) to $349 (N120,000). Click on the links above to view the latest Ulefone Power 5 price & availability on Shopping stores. It’s hard to imagine a phone battery exceeding 10,000 mAH… 5000mAH phone is enough like a New Poptel P60. will it work with ntel and other Nigerian 4g service provider ? Will this work on 4G and 3G networks in the USA? For example, AT&T 4G and 3G?